Alex Ovechkin: "We're Going To Come Back And Win The Series"
The quote feels so businesslike, I’m almost hesitant to call it a guarantee. Aren’t players supposed to be outwardly confident? To assume the best-case scenario? To believe that if they play up to their abilities, victory can actually be assured? More to the point: would you ever want anyone on your favorite team who didn’t believe that? But it is a guarantee. 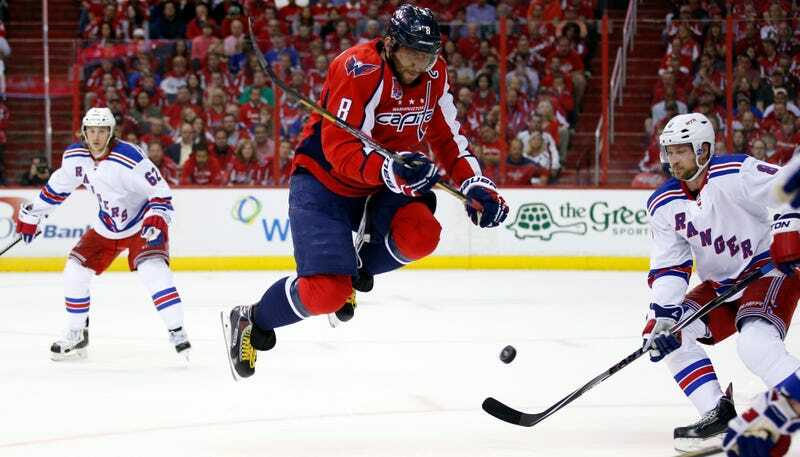 After New York hung on for a 4-3 win to invoke a Game 7 at MSG on Wednesday night, Alexander Ovechkin pronounced that much like the Rangers took a commanding lead and held on against a furious comeback, the Capitals will right their own ship and close out a series that they could have clinched twice already. There is personal frustration here. After dominating the ice through the first two games of this series, Ovechkin has now gone goalless in four straight. Which isn’t to say that goals are everything (Ovechkin’s game this year has been topflight on both ends of the ice, and he contributed last night, not least of which was sending Rangers captain Ryan McDonagh to the locker room with this board-flattening), but in a series where every game has been decided by a single goal, it’s got to be galling for the guy who’s won the last three Rocket Richard trophies to be kept off the scoresheet for so long. Barry Trotz shuffled his lines throughout the night, a classic score-effects game where the Rangers took an early lead, battened down the hatches, and were outshot 28-8 over the final two periods. The most notable change was bumping Joel Ward off of Ovechkin’s line, swapping him with Marcus Johansson and creating a second line of Ward, Evgeny Kuznetsov, and Jason Chimera. That second line scored all three Capitals goals. Trotz loves messing with his lines, especially that winger slot on the top line, but Ward had claimed it in this postseason. Trotz has been doing this long enough not let himself get too comfortable, though. So, Game 7. Everyone’s going to be looking to Ovechkin. (Fewer are going to be looking to Rick Nash, who scored his first goal of the series amid criticism. But these Rangers are historically deep and not dependent on their top line—something that doesn’t necessarily bode well for postseason success.) But at least everyone’s been here before. The Capitals as recently as two weeks ago, smothering the Islanders in Game 7 and advancing. The Rangers won two-seven game series during last season’s Finals run, one of them the culmination of a 3-1 series comeback. But after Game 7, things get novel. Barry Trotz, despite his decade-plus of success in Nashville, has never been to a conference final. Neither, incredible, has Alexander Ovechkin. It’s like a ceiling these Capitals keep bumping up against, no matter what they do. Ovechkin has declared that this time will be different.